"Knowing where your food comes from, supporting local growers, and growing your own Organic/GMO-FREE foods are, hands-down, some of the most important areas worth improving in anyone's life. First and foremost, we do not buy or grow any seed from large corporations that make Genetically Engineered seeds. We don't touch that stuff and we never will. We only work with growers who share the same stance against Genetically Modified foods as we do. Not a single one of the seeds offered on our website are from Monsanto, Seminis, or any other company affiliated with Genetically Engineered seeds. Not a single dollar goes to those companies whatsoever - and never will. We are against GMOs 100% and we refuse to support anyone that does. All of our seeds are 100% GMO-FREE. So long as you start with NON-GMO seeds and refrain from using chemicals/pesticides/etc during the growing process then the produce you grow will be "organic". In order for something to be "Organic" the USDA says you "cannot use chemical fertilizers, synthetic substances, irradiation, sewage sludge, or Genetically Modified Organisms (GMOs)!" 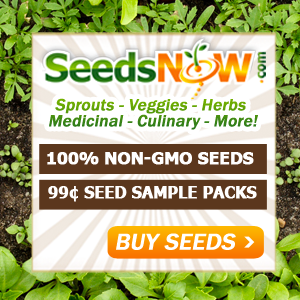 Online source for 100% Pure Non-GMO organic seeds. All 100% Non-Hybrid and Heirloom varieties. Always Raw and Always Untreated. Start growing your own organic food! "Agriculture and seeds provide the basis upon which our lives depend. We must protect this foundation as a safe and genetically stable source for future generations. We pledge that we do not knowingly buy or sell genetically engineered seeds or plants. The mechanical transfer of genetic material outside of natural reproductive methods and between genera, families or kingdoms, poses great biological risks as well as economic, political, and cultural threats. We feel that genetically engineered varieties have been insufficiently tested prior to public release. More research and testing is necessary to further assess the potential risks of genetically engineered seeds. Further, we wish to support agricultural progress that leads to healthier soils, genetically diverse agricultural ecosystems and ultimately healthy people and communities."